Showing 6 articles from February 24, 2015. People are taking to the water as an early Spring warms up the waters. Recently selected Fill-in Mayor Jason Dunsmoor was absent for the Feb. 17 Raymond City Council meeting leaving the control of the gavel in the hands of Mayor Pro Tem Vicki Flemetis. All other members of the council and department heads were present. 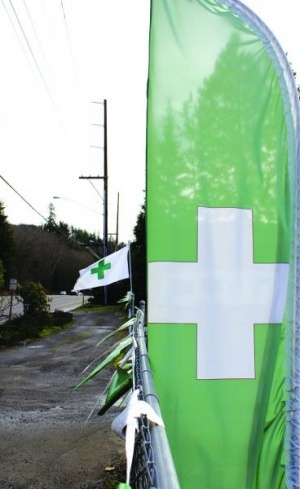 The symbol of Medical Marijuana outlets may soon be a thing of the past if current legislation continues on the path recently sent by the Washington State Senate. July 1, 2016 is becoming a very important date in the near future. What are the ramifications of Bill SB-5052? For those who are watching the ever changing environment of the Washington marijuana industry the latest bill introduced by the Washington State Senate Ways and Means Committee, SB-5052 Cannabis Patient Protection, may bring both the recreational and Medical Marijuana industries together, but for some in the business, it may not be the best thing that can happen. MENLO - The 2015 Senior Project of Kerstin Jones is just around the corner and will be held on Saturday, March 7 at the Willapa Valley High School, starting at 1 pm, doors will be open to the public at 10:30 am.